3 miles on the schedule today.....done but still really cold out!!!!! As discussed yesterday, I am a race ambassador for both the ShamRock 'n' Roll Run and the Solstice Run. You will hear me talk about these races frequently over the next six months. See how nice the finish is? It finishes in Ford field and is only a short walk back to your car from there. They also offer an expo right there after the race. A great idea so you don't miss out on some great sponsors. I wish more races would do it this way. Here's a picture after the race when we were at our car. We got our medals and some Hawaiian lei's at the finish. I wish I had taken some pictures of the entertainment. They had Hawaiian dancers at the finish - very cool and very unique! Here are some details of the Solstice Run for this year coming. Solstice Run - 10th anniversary! Website: Click HERE for all the details. Place: Northville, MI(Northville Downs Race Track) - This is a great start since you get to run around the track plus there is plenty of parking so you don't have to be nervous about that. Best time to register: By 4/20/12 for the best price, of course! Included in price: Tech shirts to all participants(guaranteed if registered by 6/19/12), special this year is 10th anniversary finisher hat to all 10 mile, 10k and 5k finishers, medals to all 10 mile and 10k finishers, AG awards for the 10 mile, 10k and 5k runs(3 deep for each 5 year category), GU brew for the 10 mile and 10k races, B-tag timing(on the bib), USATF certified course - for a serious runner, this is a real bonus, finish line recovery food, and an expo at the finish of the race. 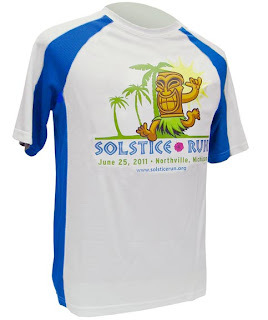 Shirt: I wear my Solstice Run and Halloween Run shirts all the time when training since they are great designs and I'm looking forward to seeing the design for 2012. Medal: Finishers medal for all 10 mile and 10k participants! Medal details coming soon! Things to keep in mind: You need to run a 12 minute pace in order to participate in the 10 mile race; otherwise, sign up for a shorter race. Also, they have a training plan designed by Doug Curtis for those looking to run the 10 mile race. It should be an incredible race once again and I can't wait to run it. If you are looking for a fun and challenging(read hilly) course, come out and join me and many others for a fun day! This race also coincides with the art fair in Northville so you will have the chance to see the art after the race as well. I love love love the solstice run, it was one of my fav courses to run last year. I'm so bummed because Alan said I could be an ambassador for both as well, but I'll be in Seattle the day of Solstice. I love it so much though that I said I would still promote it on my blog even if I can't participate in it. It's definitely a must-do race!